There's been a real push from manufacturers recently on releasing new gaming monitors, mostly thanks to the arrival of adaptive refresh rate technologies from AMD and NVIDIA. The new FreeSync and G-sync technologies have been incorporated into many new displays and we've already reviewed a few excellent options from Asus, Acer and BenQ. 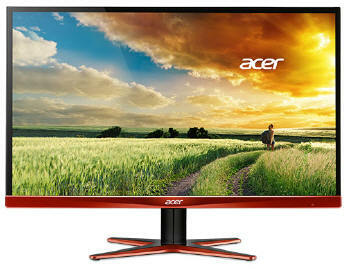 Perhaps of most interest recently was the XB270HU from Acer, the World's first 144Hz IPS-type display, with added G-sync support and a blur reduction mode (ULMB). Whilst that model is an NVIDIA G-sync capable display, Acer have now released the very similarly named XG270HU which is a screen supporting AMD's FreeSync instead. Unlike the XB model this is a TN Film screen, sporting a 1ms G2G response time and 144Hz refresh rate. It has a rather different and distinctive design as well so probably won't be easily confused. This will be the second FreeSync screen we've tested, after the recent BenQ XL2730Z. Acer's website states: "Acer XG monitors deliver powerful visuals on a frameless screen to free your gaming and movie experiences from visual borders. WQHD resolution combines with high refresh rates and short response times for ultra-smooth action. These monitors also support FreeSync technology, for tear-free and stutter-free gaming. Plus, built-in eye protection and ergonomics keep things comfortable." The XG270HU offers a decent range of connectivity options with DisplayPort, HDMI 2.0 and DL-DVI provided. The screen is not limited to DisplayPort-only like G-sync screens are (a limitation of the current G-sync module from NVIDIA), as FreeSync allows for other connections to still be offered on the screen, even though the DisplayPort is the only one to support the actual FreeSync technology. That is certainly a pro for FreeSync over G-sync The digital interfaces are HDCP certified for encrypted content and the video cables are provided in the box for DisplayPort and DVI, along with an audio cable (in the UK at least). The screen has an external power supply which comes provided. There are no USB ports provided on this model unfortunately and it is a little limited in terms of extras. There are audio in and headphone out connections, as well as integrated 2x 2W speakers. The XG270HU comes in a black and orange/bronze design with a mixture of matte and glossy plastics used. The screen has a borderless design and so has a very thin outer bezel along the top and sides which is only ~2mm thick. There is then an additional ~6.5m of inner panel border before the image starts so the actual edges are ~8.5mm thick in total. Along the bottom edge of the screen is a thicker orange/bronze coloured plastic trim measuring ~23mm thickness. There is a matte silver 'acer' logo in the middle of the bottom bezel and a small power LED and logo in the bottom right hand area, but no other markings or writing on the screen at all. 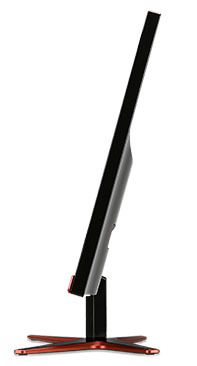 The back of the screen is finished in a glossy black plastic as shown above. The interface connections are near the bottom as shown above, and there's a large Acer logo in the upper left hand corner (as viewed from the back). There is no cable tidy provided unfortunately although the screen sits quite low down so it's hard to see anything behind the monitor from a normal viewing position. There are no VESA mounting holes on this model so you cannot wall or arm mount the screen sadly. The stand attaches at the bottom of the back of the screen as you can see above, with the base being packaged separately but easily screwed on to the arm. The base is again glossy black plastic with orange/bronze coloured trim around the edges. It provides a wide base for the screen but because of the small supporting arm and the fact it attaches to the bottom of the screen, the monitor is very wobbly if touched or moved. Day to day it remains stable on the desk while typing and working, but if you want to move it around or use the OSD menu then it does wobble a lot. From a side view the screen has a nice thin profile thanks to its W-LED backlighting and external power brick. It would have been a nice option for wall-mounting had there been VESA support provided. The tilt function is smooth but a little stiff to move, but it does offer a reasonable range of angles to choose from as shown above. The screen is wobbly on the stand though as you move it around so you probably won't want to adjust it regularly. There are unfortunately no other ergonomic adjustments offered from the stand here so there's no height, swivel or rotate offered. The limited stand is certainly a weak point of this display. The materials were of a decent enough standard and the build quality felt ok, let down a bit by the wobbly stand design and light, plastic feel to everything. There was no audible noise from the screen, even when conducting specific tests which can often identify buzzing issues. The whole screen remained cool even during prolonged use as well which was pleasing. The back of the screen provides a connection for the power brick which is provided with the screen. There are then connections for headphone out, audio in, dual-link DVI, DisplayPort and HDMI. There are no USB ports offered on this model. The OSD menu is accessed and controlled via a series of 5 pressable buttons located on the bottom edge of the screen on the right hand side. There is also a pressable on/off button with a small LED light above it on the front of the bezel. This glows blue during normal operation and amber in standby. Pressing the last button brings up the main OSD menu. This is split in to 4 sections down the left hand side, with the options then shown on the right hand side for those sections. The first 'picture' menu has most of the settings in it. There are options for brightness, contrast, low blue light mode, colour temp, colour adjustment and gamma presets here. The second 'OSD' menu only has an option to control the timeout of the menu. The third 'setting' menu has a few useful options. You can switch between the different video inputs here although it is quite fiddly to get to this option if you ever want to switch video input regularly. It's a shame you can't make this one of the quick access options as drilling several layers into the OSD menu each time gets annoying. You can alter the overdrive (OD) setting here, although that's also available from the quick access menu. The aspect ratio control options are also in this section with settings for full, aspect and 1:1 provided. The final 'information' section confirms your current settings. Overall the menu was quick and easy to navigate and felt logical in layout. It was a bit annoying if you wanted to switch inputs, and some of the settings (e.g. gamma presets) were quite limited. In terms of power consumption the manufacturer lists maximum usage of 42.0W, minimum of 27.8W and 0.37W in standby. We carried out our normal tests to establish its power consumption ourselves. 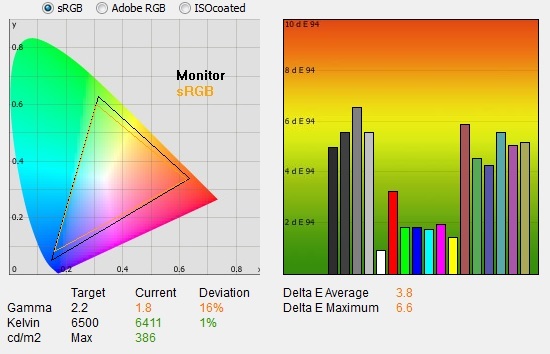 We tested this ourselves and found that out of the box the screen used 47.9W at the default 100% brightness setting. Once calibrated the screen reached 23.2W consumption, and in standby it used only 1.2W. We have plotted these results below compared with other screens we have tested. 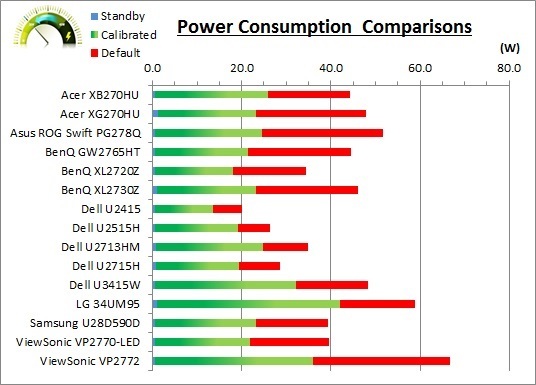 The consumption is comparable actually to the other W-LED backlit displays we have tested, including competing gaming models like the Asus ROG Swift PG278Q and BenQ XL2730Z. Larger screens (Dell U3415W, LG 34UM95) and GB-r-LED backlit displays (e.g. ViewSonic VP2772) use a bit more than most W-LED backlights. 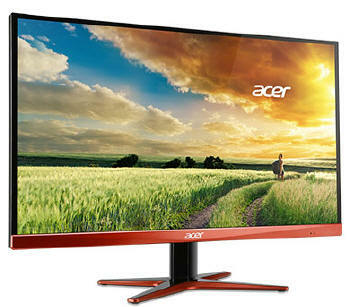 The Acer XG270HU features an AU Optronics M270DTN01.3 TN Film technology panel which is capable of producing 16.7 million colours. It is unclear whether this is a 6-bit+FRC module (as most TN Film panels are), or an 8-bit panel (as the TN Film panel in the Asus ROG Swift PG278Q is). We have been unable to confirm via a panel spec sheet, although the Acer spec sheets list 8-bit which seems likely. The panel part is confirmed when dismantling the screen as shown below. It should be noted that this is a slightly different revision to the panel used in the BenQ XL2730Z (M270DTN01.0), and different to that in the popular Asus ROG Swift PG278Q (M270Q002 V0) despite the similar specs of the screens. The screen uses a White-LED (W-LED) backlight unit which has become very popular in today's market. This helps reduce power consumption compared with older CCFL backlight units and brings about some environmental benefits as well. The W-LED unit offers a standard colour gamut which is approximately equal to the sRGB colour space. Anyone wanting to work with wider colour spaces would need to consider wide gamut CCFL screens or the newer range of GB-r-LED type displays available now. If you want to read more about colour spaces and gamut then please have a read of our detailed article. At 100% brightness a constant voltage is applied to the backlight. As you reduce the brightness setting to dim the backlight a Direct Current (DC) method is used, as opposed to any form of PWM. This applies to all brightness settings from 100% down to 0%. The screen is flicker free as advertised, and as per a lot of Acer's new screens nowadays. The brightness control gave us a very good range of adjustment. At the top end the maximum luminance reached 362 cd/m2 which was high, even a little more so than the specified maximum brightness of 350 cd/m2 from the manufacturer. There was a decent 276 cd/m2 adjustment range in total, and so at the minimum setting you could reach down to a fairly low luminance of 85 cd/m2. This should be adequate for those wanting to work in darkened room conditions with low ambient light, although not as dark as you can drive some screens. A setting of 16 in the OSD menu should return you a luminance of around 120 cd/m2 at default settings in this preset mode (standard). It should be noted that the brightness regulation is controlled without the need for Pulse Width Modulation, using a Direct Current (DC) method for all brightness settings between 100 and 0% and so the screen is flicker free as advertised. We have plotted the luminance trend on the graph above. The screen behaves as it should in this regard, with a reduction in the luminance output of the screen controlled by the reduction in the OSD brightness setting. This is not a linear relationship as you can see, with the settings from 100 to 60 controlling a steeper adjustment curve than settings from 60 to 0. The average contrast ratio of the screen was good, but not excellent, for a TN Film panel with an average of 856:1. This was pretty stable across the brightness adjustment range as shown above. Initially out of the box the screen was set in the default 'standard' eColor Management preset mode with gamma mode of 2.2, and colour temperature of 'warm'. To the naked eye the screen felt very bright as it was also at its default 100% brightness setting, and it felt a little washed out. We went ahead and measured the default state with the i1 Pro. The CIE diagram on the left of the image confirms that the monitors colour gamut (black triangle) is roughly equal to the sRGB colour space. There is some minor over-coverage in green and blue shades but not by anything too massive. 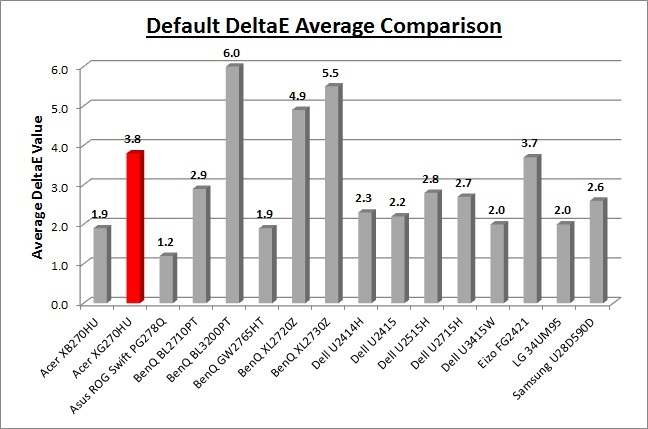 Default gamma was recorded at 1.8 average, leaving it with a 16% deviance from the target. Keep in mind this screen is aimed at gaming uses and so a large deviance from the 2.2 you'd normally want to use for desktop use is not too much of a surprise. White point was measured at 6411k, leaving it only 1% out from the 6500k we'd ideally want for desktop use which was pleasing. Luminance was recorded at a very bright 386 cd/m2 which is too high for prolonged general use. The screen was set at a default 100% brightness in the OSD menu but that is easy to change of course to reach a more comfortable setting without impacting any other aspect of the setup. The black depth was 0.45 cd/m2 at this default brightness setting, giving us a decent static contrast ratio of 856:1 for a TN Film panel. Colour accuracy was not great due to the 1.8 gamma. There was an average dE of 3.8 and maximum of 6.6. Testing the screen with various gradients showed no banding thankfully. There was some obvious gradation evident in darker tones. Unfortunately on this screen there is no easy way to correct the gamma curve, since there are only options in the OSD menu for gamma modes 2.2 and 1.8 (the latter moving it even further away from 2.2). A calibration tool, or perhaps our calibrated ICC profile is going to be required to correct that on this screen if you want to use it for more general uses reliably. When you change any setting in the OSD menu, including brightness, it changes you out of the 'standard' eColor mode and in to the 'user' mode. From there we switched to the 'user' colour temperature mode as well which would give us access to the RGB channels. Altering these OSD settings allowed us to obtain an optimum hardware starting point and setup before software level changes would be made at the graphics card level. We left the LaCie software to calibrate to "max" brightness which would just retain the luminance of whatever brightness we'd set the screen to, and would not in any way try and alter the luminance at the graphics card level, which can reduce contrast ratio. These adjustments before profiling the screen would help preserve tonal values and limit banding issues. After this we let the software carry out the LUT adjustments and create an ICC profile. Average gamma was now corrected to 2.2 average with a 0% deviance, correcting the large 16% deviance we'd seen out of the box. The minor 1% white point deviance had now been corrected, bringing it in line with the target at 6520k. Luminance had been improved thanks to the adjustment to the brightness control and was now being measured at 121 cd/m2. This left us a black depth of 0.15 cd/m2 and gave us a fairly decent static contrast ratio (for a TN Film panel) of 828:1. Colour accuracy of the resulting profile was excellent, with dE average of 0.4 and maximum of 0.8. LaCie would consider colour fidelity to be very good overall. Testing the screen with various colour gradients showed mostly smooth transitions. There was some slight gradation in darker tones but no banding introduced due to the adjustments to the graphics card LUT from the profilation of the screen which was pleasing. You can use our settings and try our calibrated ICC profile if you wish, which are available in our ICC profile database. Keep in mind that results will vary from one screen to another and from one computer / graphics card to another. Default setup of the screen out of the box was not ideal for day to day normal uses, with the gamma being the main area of weakness. It is set up more for gaming needs with a 1.8 average, 16% out from our 2.2 target. This is a gaming screen keep in mind so it is perhaps not surprising, but with the lack of any useful gamma controls from the OSD it is tricky to adjust without a calibration tool. Our calibrated ICC profile may assist of course but ideally you'd want your own calibration device if you want to set the screen up more accurately for normal uses. The white point was at least close to the 6500k target and contrast ratio was decent enough for a TN Film panel out of the box at 861:1. The display offered reasonable contrast ratios after calibration at 828:1. This was a little lower than we'd seen from some other recent TN Film models we've tested like the BenQ XL2730Z (917:1) and Asus ROG Swift PG278Q (858:1), but not by much. Of course it can't compete with VA panel types which can reach over 2000:1 easily, and commonly up to 3000:1, even close to 5000:1 in the case of the Eizo FG2421. Viewing angles of the screen were as you might expect from a TN Film panel. Unfortunately this panel technology is inherently poor in this field, and so viewing angles are more restrictive than other competing technologies like IPS and VA variants. Although the manufacturer will quote a viewing angle of 170 / 160 (a classic indication that a TN Film panel is being used by the way if in doubt), in practice there are some obvious contrast and colour tone shifts horizontally, and especially vertically. As you move your head from side to side in a horizontal plane, there is a contrast shift and the image becomes darker and introduces a slight green/yellow hue. As you move to a wider angle the image can become more washed out as well. Vertically the fields of view are more restrictive still. From above the image becomes very pale and washed out, while from below there is a characteristic TN Film darkening of the image. Unfortunately vertically the viewing angles will introduce noticeable shifts in the contrast and colour tone of the image which mean that for any colour critical work it is not really very well suited. TN Film panels have long suffered from these restrictive viewing angles due to the nature of their pixel structure. They are still fine for a single user for general use and certainly the TN Film panels offer their advantages when it comes to pixel response times and refresh rate for gaming. If however, you were hoping to do any colour critical or photography work you may find these shifts in the appearance of the image difficult. An IPS-type panel would probably be a wiser choice if you were looking for a screen with much wider viewing angles but having said that you are probably mainly interested in gaming if you are considering this screen. Remember, the XG270HU is specifically designed for gaming, and so you will have to live with some of the sacrifices of TN Film to get the kind of gaming performance and features offered here. On a black image there is a moderate pale grey tint introduced to the image when viewed from a wide angle. This isn't too severe and shouldn't present any real problems in practice. Certainly not the obvious white glow you get from most modern IPS-type panels in similar situations and fairly standard for a TN Film panel. The luminance uniformity of the screen was reasonable. There was a drop in luminance in the lower right hand corner, where it dropped down to 98 cd/m2 in the most severe example. 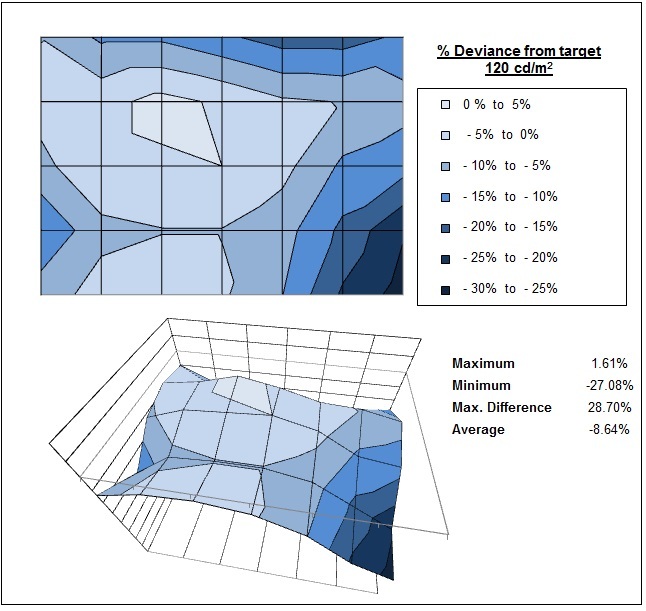 Around two thirds of the screen was within a 10% deviance of the centrally calibrated point. As usual we also tested the screen with an all black image and in a darkened room. A camera was used to capture the result. The camera showed there was very little in the way of bleeding or clouding from the backlight. The bottom corners were a little lighter, but you couldn't really spot this with the naked eye. In normal uses there was no issue at all. The XG270HU feature a large 2560 x 1440 WQHD resolution which is still pretty rare for gaming 27" screens. There's only been a few released so far - the Asus ROG Swift PG278Q (G-sync TN Film), Acer XB270HU (G-sync and IPS) and the BenQ XL2730Z (FreeSync TN Film). So in this space there's still a limited choice when it comes to high resolution gaming screens, with most other models still offering only 1920 x 1080. This extra resolution is excellent both for gaming and for other uses. The pixel pitch of 0.233 mm is quite small as a result though, and by comparison a standard 16:10 format 24" model has a pixel pitch of 0.270mm and a 30" model has 0.250mm. These ultra-high resolution 27" models offer a tight pixel pitch and therefore small text as well. We found it quite a change originally coming from 21.5 - 24" sized screens back in the day, even those offering quite high resolutions and small pixel pitches. Although now we are very used to working with 27" 1440p screens all the time and find them very comfortable and a significant upgrade over 1080 / 1200p models. Some users may find the small text a little too small to read comfortably, and we'd advise caution if you are coming from a 19" or 22" screen for instance where the pixel pitch and text are much larger. The extra screen size takes some getting used to over a few days as there really is a lot of room to work with but once you do, it's excellent. For those wanting a high resolution for their work, this is a really good option. The image was very sharp and crisp and text was very clear. With its WQHD display, you enjoy 77% more desktop space than a full HD screen to spread out your windows and palettes. The frameless thin bezel design mean that the XG270HU could be easily integrated into a multi-screen set up if you wanted. The moderate AG coating of the TN Film panel could be considered a bit grainy, especially on white office backgrounds to a lot of people. It's not as clear as modern IPS coatings or any semi-glossy solution. Still, it's not as grainy as old IPS panels and is on par with other TN Film matrices we've tested. Perhaps the main issue with this panel technology though is the restrictive viewing angles, making contrast and colour tone shifts a bit of a problem when it comes to colour critical work. They are the same here as other TN Film panels, being restrictive especially vertically. The screen is fine when viewed head on though really for office and text work, but for colour critical work or photo editing etc you'd be better off with an IPS-type panel. The default setup of the screen was a bit restrictive for normal uses, as the gamma is set up more for gaming, and hard to adjust without a calibration tool (or maybe our calibrated ICC profile). The brightness range of the screen was very good, with the ability to offer a luminance between 362 and 85 cd/m2. This should mean the screen is perfectly useable in a wide variety of ambient light conditions, including darkened rooms although we would have maybe hoped for a slightly lower minimum luminance value. 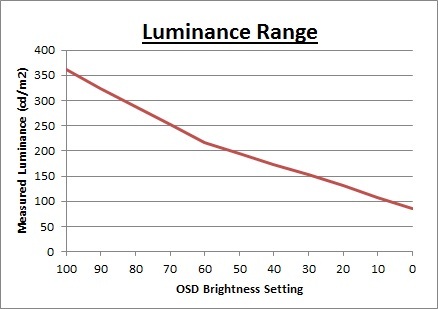 A setting of ~16 in the OSD brightness control should return you a luminance close to 120 cd/m2 out of the box. On another positive note, the brightness regulation is controlled without the need for the use of the now infamous Pulse-Width Modulation (PWM), and so those who suffer from eye fatigue or headaches associated with flickering backlights need not worry. There is also an additional Low Blue Light mode which is a useful extra. There was no audible noise or buzzing from the screen, even when specifically looking for it using test images with a large amount of text at once. The screen also remains cool even during prolonged use. There are limited extras offered on this screen with audio input, headphone socket and integrated basic speakers being about the only things provided. There's sadly no USB ports here which we do miss, or anything like ambient light sensors or card readers which can be useful in office environments. This is primarily a gaming screen remember. There was also a very limited range of ergonomic adjustments available from the stand with only tilt adjustment offered. There isn't a VESA mount option either so you're stuck with the stand on this screen. The whole thing was also pretty wobbly on the stand if you need to use the OSD menu or move it around. The screen is designed to run at its native resolution of 2560 x 1440 and at a 144Hz recommended refresh rate. However, if you want you are able to run the screen outside of this resolution. We tested the screen at a lower 1920 x 1080 resolution to see how the screen handles the interpolation of the resolution, while maintaining the same aspect ratio of 16:9. At native resolution the text was very sharp and clear. When running at a 1080p resolution the text is still nice and clear, with low levels of blurring. You do lose some screen real-estate as well of course but the image seems to be interpolated quite well from 1080p sources. That's a good sign if you need to game at a lower resolution due to the demands on your system of a high refresh rate. The Acer XG270HU is an interesting screen to test when it comes to gaming. It's only the third 27" gaming screen available with a 2560 x 1440 resolution and TN Film panel. The first one released being the extremely popular Asus ROG Swift PG278Q we tested in July 2014. That was a TN Film based model with 1ms G2G response time, 144Hz refresh rate and NVIDIA's G-sync technology. Very recently in April 2015 we tested the BenQ XL2730Z with a similar (not identical) panel, with the same 1ms G2G response time and 144Hz refresh rate support. That model was the first screen we've tested using AMD's new FreeSync technology and offered a massive range of BenQ gaming features. 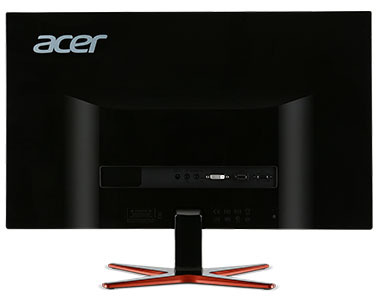 The XG270HU should not be confused with the similarly named XB270HU model from Acer. That is an IPS-type screen with 144Hz and NVIDIA G-sync support. This model is a TN Film model with 144Hz, 1ms G2G and FreeSync support. It should be noted that this screen does not feature any added blur reduction mode, as that is not a feature of FreeSync like it is on NVIDIA's G-sync module. Acer have not added their own blur reduction mode here, unlike BenQ who added one separately to the XL2730Z. To make the most of this screen you will want to have a suitable AMD graphics card which supports Adaptive Sync/FreeSync. That will allow you to use one of the most interesting new features of this latest screen. One of the key selling points of FreeSync is that unlike G-sync it does not add a massive cost overhead to the display, and so actually even if you don't have a suitable graphics card to use FreeSync you can still benefit from everything else this screen has to offer. Don't forget there's a significant change when it comes to resolution compared with the older XL models here. It should be noted that the screen can also be used from NVIDIA graphics cards without issue, and there's a good range of connectivity options provided to suit whatever card you've got. Again, you won't be able to use FreeSync, but everything else should work fine. We expect if you're looking at such a high end gaming display that you will also have a pretty high end gaming PC to run it, so 2560 x 1440 at 144Hz would of course be preferable over anything else. That will give you the highest frame rate and smoothest motion in gaming. We hope you have a system powerful enough to run this screen at its intended 2560 x 1440 resolution and 144Hz refresh rate, as really that's where you will get the optimum performance. 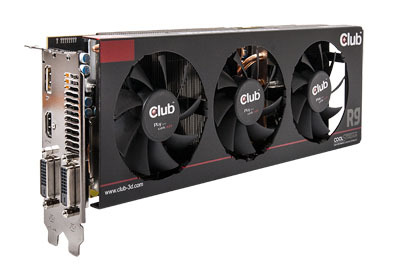 You do need to consider the power of your graphics card though as there will be a big demand on your system for gaming at these kind of settings. Fortunately though there is also the new AMD FreeSync technology which will offer you smooth gaming even at lower frame rate outputs. Read on for more information. The XG270HU is rated by Acer as having a 1ms G2G response time, which indicates the panel uses overdrive / response time compensation (RTC) technology to boost pixel transitions across grey to grey changes. There is user control over the overdrive impulse within the OSD menu using the 'AMA' (Advanced Motion Accelerator) option. The part being used is the AU Optronics M270DTN01.3 TN Film panel. 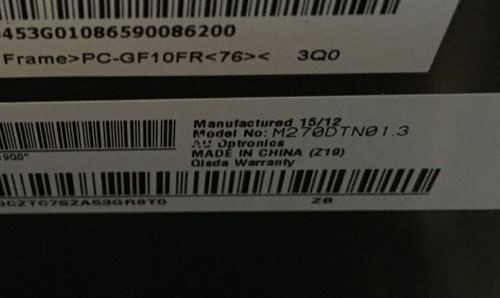 This is a very similar panel to that used in the BenQ XL2730Z, which was the M270DTN01.0. Have a read about response time in our specs section if you need additional information about this measurement. The XG270HU comes with a user control for the overdrive impulse available within the OSD menu in the 'setting' section as shown above. There is also quick access to it from the menu. There are 3 options available here under the OD (Overdrive) option in the menu for Off, Normal and Extreme. First of all we carried out a smaller sample set of measurements in all three of the OD response time settings. These, along with various motion tests allowed us to quickly identify which was the optimum overdrive setting for this screen. For completeness we tested the response times in each of these OD modes at various refresh rates, ranging from a normal 60Hz, up to the maximum 144Hz. This allowed us to establish if there were any differences in response time behaviour at each refresh rate as well. 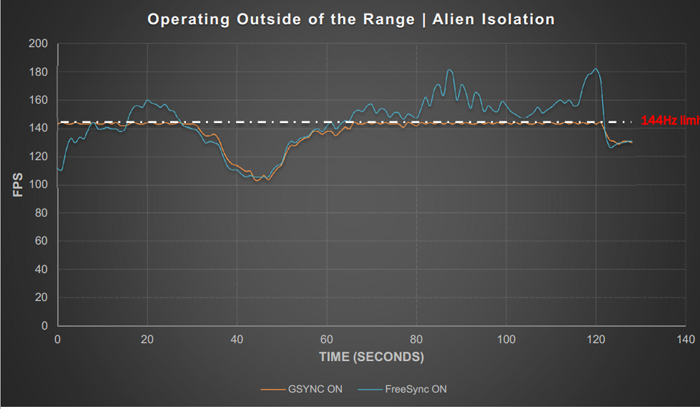 Since FreeSync will by its nature dynamically control the refresh rate, it's important to establish if there is any impact on pixel response time behaviour when it does. We will say up front now to save time that there was practically no difference in pixel response time/overshoot behaviour between each refresh rate setting. The tests shown below are at 144Hz for reference, but it made no difference really over 60Hz or anything in between. Firstly we tested the response times with OD set to Off. Average G2G was pretty slow for a modern TN Film panel at 7.7ms, with some transitions ranging up to 11 - 15ms. The overdrive impulse was turned off here and so there was at least no overshoot at all. With response times being slow though, you will almost certainly want to push for a higher setting which is common on most screens. Note that even at 7.7ms G2G, this is still faster than all the decent IPS-type 60Hz screens which reach about 8.5ms G2G at best (without overshoot being an issue) so it's not exactly "slow". We switched up to the middle 'Normal' setting and tested again. Response times had been improved nicely, dropping from the 7.7ms G2G average we'd seen before to 4.0ms. Some transitions reached down to as low as 1.1ms so the screen just about lives up to its spec as well in this mode (it reaches 1.0ms in Extreme mode below). There were some transitions which now showed some low levels of overshoot, but surprisingly very little at all. Normally you have to make do with some fairly moderate levels of overshoot on a lot of fast TN Film screens when you push them to the optimum response time setting. Thankfully Acer haven't been too aggressive here and so only a little is introduced. The highest 'Extreme' setting improved response times a bit further down to 2.9ms G2G average. The problem is that the overshoot become much higher and far more noticeable. It was to an extent that made this OD mode too aggressive. We would recommend sticking to the Normal mode. If we take some test photos using the PixPerAn tool you can make some further visual comparisons between the overdrive settings. With OD off the slower response times lead to some low levels of motion blur. It's not actually a massive amount as even with an 7.7ms G2G response time measured it's a little faster than a decent IPS-type panel anyway. Once you turn the OD setting up to Normal the blurring is reduced nicely and quite noticeably, with the moving image becomes sharper and clearer. Some minor slight dark trailing is evident but it's hard to spot in these tests. If you switch up to the Extreme OD setting the overshoot does become very apparent, and there's a dark and pale halo behind moving objects. Definitely better to stick with the Normal OD setting. Important - see our FreeSync section of the review regarding some limitations with OD settings when paired with a FreeSync graphics card/driver/connection at this time. Having established that the OD Normal mode offered the best response/overshoot balance we carried out our normal wider range of measurements as shown below. Tests were completed at the maximum 144Hz refresh rate although the refresh rate made no real difference to the response times anyway. 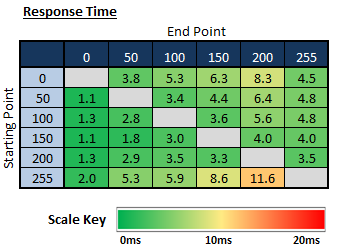 The average G2G response time was more accurately measured at 4.3ms which was very good overall. Rise times were slightly slower than fall times but not by anything significant. Some measurements reached almost as low as the advertised 1ms figure as well, at 1.1ms minimum. 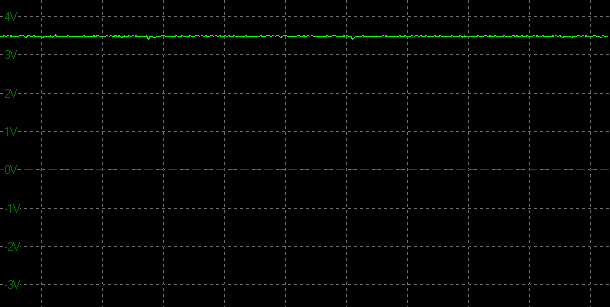 There was one problematic transition which was slower at 11.6ms (255-200) for some odd reason. 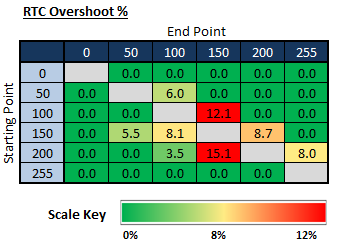 There was some overshoot introduced unfortunately at this OD level, but it was pretty low overall. It wasn't too severe, and certainly less than if you push OD up to the maximum Extreme mode. Still, a couple of transitions showed pretty high overshoot values. It was however better than we've seen from other fast TN Film models including the BenQ XL2730Z and Asus ROG Swift PG278Q. There was less overshoot here on the Acer screen which was pleasing. The response time performance of the XG270HU was comparable with other fast TN Film screens we've tested of late. With a 4.3ms G2G response time It's a little slower than the Asus ROG Swift PG278Q (2.9ms) and BenQ XL2730Z (3.4ms) but delivers less overshoot which is arguably a little better overall. We prefer the fact Acer have toned down the overdrive impulse a little to reduce overshoot when using OD Normal as compared with a lot of screens at their optimum response time setting. In practice the Acer XG270HU performed best with the OD overdrive setting on 'Normal'. Motion blur was minimal and the moving image looked sharp and crisp. Motion felt very fast and fluid thanks to the 144Hz refresh rate, something which you can't really pick out with the camera in these specific tests. There was some slight overshoot detected in the form of some dark trailing but it was not distracting, and compared to some other fast TN Film screens we've seen, a little lower. If we compare the XG270HU to the other two 2560 x 1440 resolution TN Film gaming screen we've tested the similarities are quite obvious. All three models offered very low response times, and in practice it was very difficult to spot any real difference in smoothness or blurring. The Acer did show slightly less overshoot though and the dark trails were a little less pronounced which was pleasing. We know from our oscilloscope tests that there is less overshoot on this model and we can see that visually in motion tests. 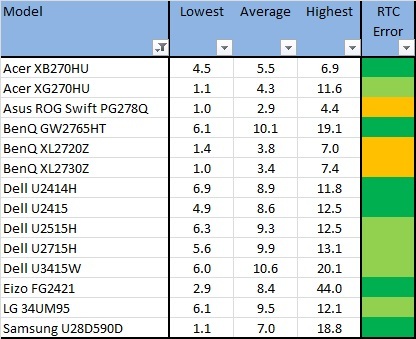 It is interesting to compare the XG270HU against some of the other popular 27" models we have tested with 2560 x 1440 resolutions, this time with IPS-type panels. 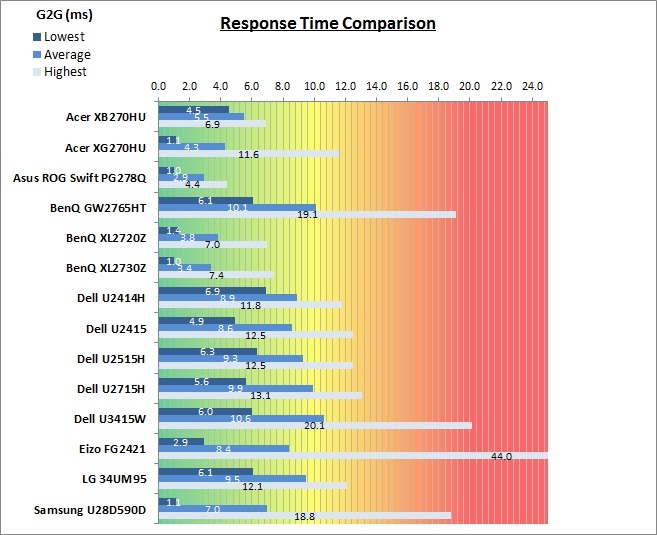 The Dell U2713HM is about as fast as you can get from a 60Hz IPS screen at the moment, with an 8.5ms G2G response time and no overshoot detected. The Dell U2715H and BenQ BL2710PT are a little slower at around 10ms G2G and so there is a more noticeable blurring to the image. Overall the XG270HU feels snappier and faster than these other models because of its much higher refresh rate. While the response times are low enough on models like the U2713HM to produce pretty low levels of motion blur, you are still limited by the refresh rate of the screen. Once you reach levels where the response time is sufficiently low to not be a major factor in blurring, you get a far more effective elimination of motion blur by increasing the refresh rate or adding additional blur reduction techniques. If you have a look at our following sections with the pursuit camera you can see what a difference it makes bumping the refresh rate up from 60Hz to 144Hz in actual perceived motion blur. We've also included a comparison above against a couple of non TN Film gaming screens we've tested. Then there is a comparison against the excellent Acer Predator XB270HU, the World's first 144Hz IPS-type panel. This had very low response times for an IPS panel, not quite as low as the TN Film screens here but offsetting that slightly higher response time is the fact that it has no overshoot at all! This screen also benefits from the high frame rates and has support for NVIDIA G-sync and ULMB as well. Then there is the MVA based Eizo FG2421 screen with a fairly fast response time (especially for the panel technology being used) and 120Hz refresh rate support. There is also an additional 'Turbo 240' motion blur reduction mode which really helps reduce the perceived motion blur in practice. Obviously a huge part of the Acer XG270HU is the addition of the new AMD FreeSync technology, their branded version of the VESA standard Adaptive Sync. It's a competing technology to NVIDIA's already available G-sync and so the principles of its operation remain the same. We've discussed G-sync in our Asus ROG Swift PG278Q and Acer XB270HU reviews already in detail, and we've also recently looked at FreeSync when we reviewed the BenQ XL2730Z during April 2015. 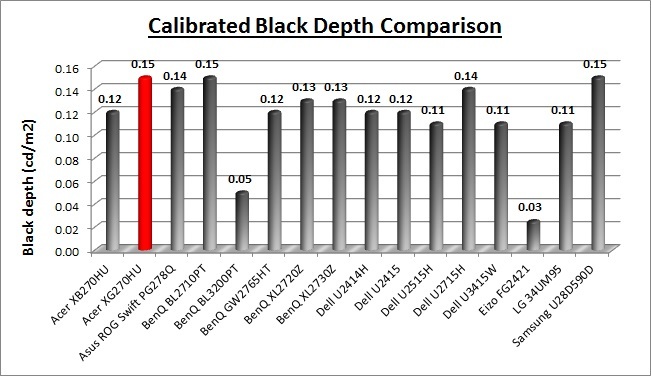 Some content in this section is copied from the BenQ review to save you reading it there, but if you've read the BenQ XL2730Z review you may want to skip over the FreeSync overview/operation sections. As an introduction, monitors typically operate at a fixed refresh rate, whether that is 60, 120 or 144Hz. When running graphically intense content like games, the frame rate can of course fluctuate somewhat and this poses a potential issue to the user. There are traditionally two main options available for how frames are passed from the graphics card to the monitor using a feature called VSYNC, whether Vsync is turned on or off. The first diagram below come from NVIDIA's G-sync content but we will leave them in to demonstrate how V-sync works as the same principles apply here when talking about FreeSync. To overcome these limitations with Vsync, both NVIDIA and AMD have introduced new technologies dubbed G-sync and FreeSync respectively. We've already seen G-sync used for quite a few months now with great success. The BenQ XL2730Z will be the first screen we've tested featuring AMD's version as FreeSync was only launched on March 19th 2015. The idea of both technologies is based on variable refresh rates. These technologies can be integrated into monitors allowing them to dynamically alter the monitor refresh rate depending on the graphics card output and frame rate. The frame rate of the monitor is still limited in much the same way it is without a variable refresh rate technology, but it adjusts dynamically to a refresh rate to match the frame rate of the game. By doing this the monitor refresh rate is perfectly synchronised with the GPU. You don’t get the screen tearing or visual latency of having Vsync disabled, nor do you get the stuttering or input lag associates with using Vsync. You can get the benefit of higher frame rates from Vsync off but without the tearing, and without the lag and stuttering caused if you switch to Vsync On. Both G-sync and FreeSync operate on this principle of dynamically controlling the refresh rate. There's a few differences between how the technology is implemented though. NVIDIA G-sync requires a proprietary G-sync module to be added to the monitor, which comes at quite a high cost premium. You will notice as a result that the retail price of compatible G-sync monitors is often £100 - 200 higher than similar competitors because of this module. There is another limitation with adding a G-sync module in that it is only designed to work with a single interface currently, and so supporting monitors only offer a single DisplayPort connection. That makes those monitors somewhat restrictive when it comes to attaching any other devices of computers. The screens are also provided without a scaler, and so hardware aspect ratio control options are not offered. That's not as important as on some screens given you are restricted to a single DP interface anyway, and the PC can handle the scaling for you. It does also mean that signal processing lag is incredibly low as a result, another positive for gaming. G-sync modules also support a native blur reduction mode dubbed ULMB (Ultra Low Motion Blur). This allows the user to opt for a strobe backlight system if they want, in order to reduce perceived motion blur in gaming. It cannot be used at the same time as G-sync since ULMB operates at a fixed refresh rate only, but it's a useful extra option for these gaming screens. Of course since G-sync/ULMB are an NVIDIA technology, it only works with specific G-sync compatible NVIDIA graphics cards. While you can still use a G-sync monitor from an AMD/Intel graphics card for other uses, you can't use the actual G-sync or ULMB functions. On the other hand AMD FreeSync technology costs virtually nothing for a monitor manufacturer to adopt and so there is no price premium really for supporting monitors, hence the name. Most of them already had the relevant components in their supply chains, but need the right software to come along to expose latent capabilities. With the help of VESA, the DisplayPort Adaptive-Sync specification was born to do exactly that. DisplayPort Adaptive-Sync has no unique material or licensing costs, and AMD FreeSync technology builds on top of that industry standard to give gamers a benefit in all of their games. No licensing. No proprietary hardware. No incremental hardware costs. So as the name suggests, the key advantage of FreeSync really is in the cost! 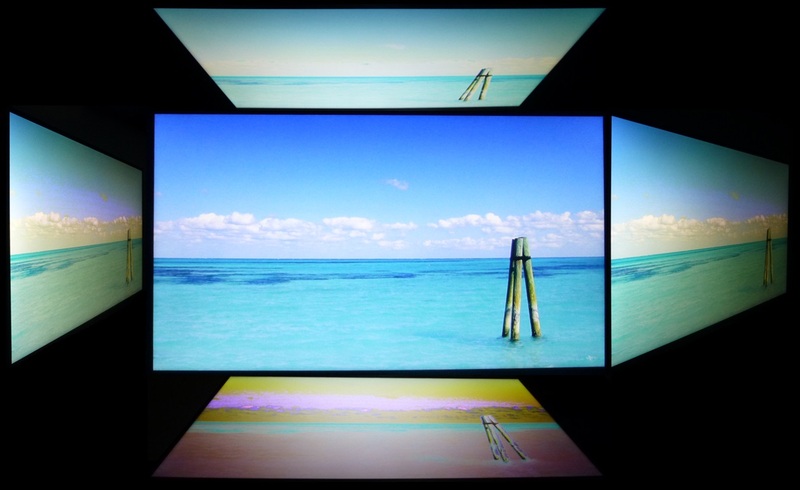 Thankfully since you don't need a dedicated extra module added to the screen you can still offer multiple video inputs on the screen without problems. You can only use FreeSync over DisplayPort, but there's no issue with including HDMI, DVI, D-sub etc to offer the user multiple interface options. You're not limited to just a single DisplayPort like with G-sync. Scalers can also be provided as normal for hardware aspect ratio control although there may be additional signal processing lag added depending on the electronics and scalers manufacturers use. They will need to focus closely on reducing lag as they do with current non-FreeSync monitors. There is no native blur reduction mode coupled with FreeSync support so it is down to the display manufacturer whether they add an extra blur reduction method themselves. 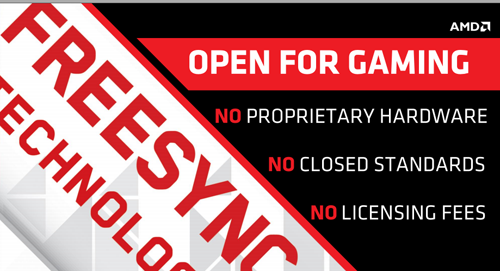 FreeSync can only be used from compatible AMD graphics cards, and you cannot use FreeSync from an NVIDIA card. You can still use a FreeSync monitor from an NVIDIA card without problems, just not the actual FreeSync feature. We don't want to get in to any kind of NVIDIA vs. AMD debate here. What this really boils down to is whether you're an NVIDIA or AMD graphics user. At the moment there isn't a single standard which works from all graphics cards, so you need to pick a monitor to match your graphics choice. AMD's option is cheaper and more versatile for manufacturers to adopt but we don't feel that it will mean we will have a much larger selection of FreeSync monitors to choose from. At the end of the day the monitor manufacturers need to cater for their audience, and with such a huge market share from NVIDIA they would be mad to ignore G-sync offerings. Maybe at some point there will be a common approach between NVIDIA and AMD but with both technologies being so new at the moment, we can't see that happening for a while. G-sync may be more expensive, and limited when it comes to connection options at the moment, but there is the added benefit of the native ULMB included don't forget. 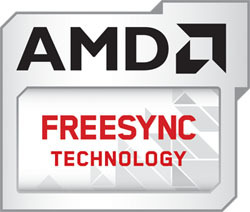 For more information from AMD on FreeSync, see their website. Within the Catalyst Control Centre there is an added configuration option for FreeSync at the bottom as shown in the screenshot below. You still have access to all the normal OSD controls. We don't want to go into too much depth about game play, frame rates and the performance of FreeSync here as we will end up moving away from characteristics of the monitor and into areas more associated with the operation of the graphics card and its output. FreeSync is a combined graphics card and monitor technology, but from a monitor point of view all it is doing is supporting this feature to allow the graphics card to operate in a new way. We'd encourage you to read some of the FreeSync reviews online as they go into a lot more detail about graphics card rendering, frame rates etc as well. 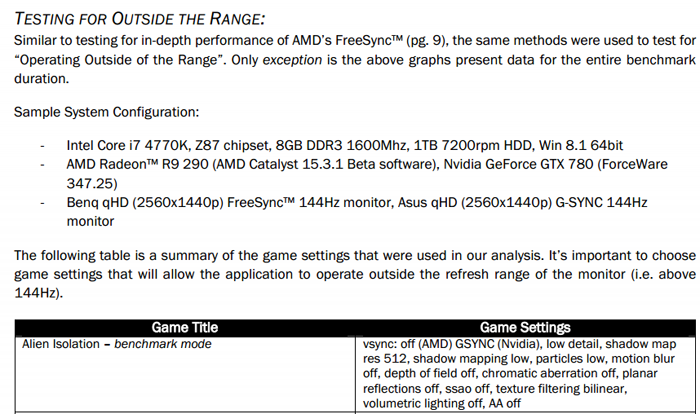 Within the AMD press material and presentation which we were invited to, they had carried out some tests of FreeSync and noted a minor improvement in frame rates when FreeSync was enabled. We're talking extremely minor here, up to about half a frame difference at best. Still, it's better than any drop in performance! On the other hand they found a minor drop in frame rate performance when testing NVIDIA G-sync, down by a couple of frames at most. 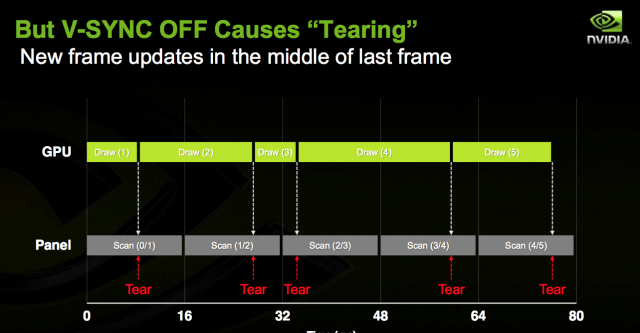 NVIDIA had acknowledged this minor performance drop in the past although said they were working on it. For those interested, there's some more information here about the test environments used by AMD. Really any difference here is extremely minor and won't make any practical difference to the user. 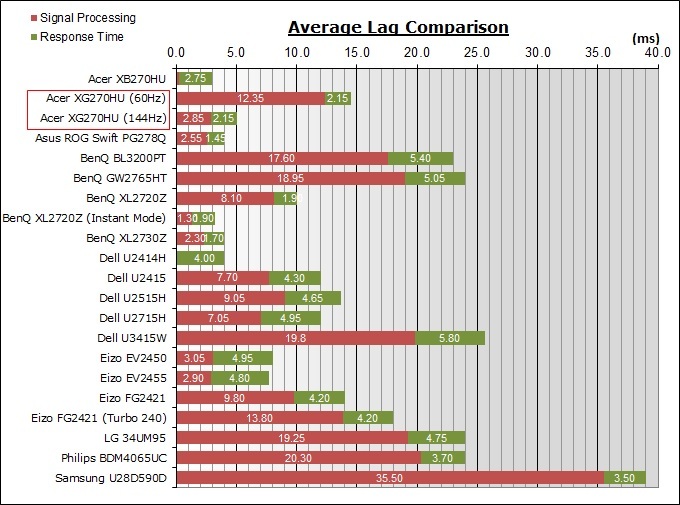 Anandtech actually carried out some further tests themselves and found no discernable difference between the two solutions. Perhaps there's some very minor difference somewhere, but not something to worry about at all. We only include it here as you're likely to hear about this in any AMD vs. NVIDIA conversations. 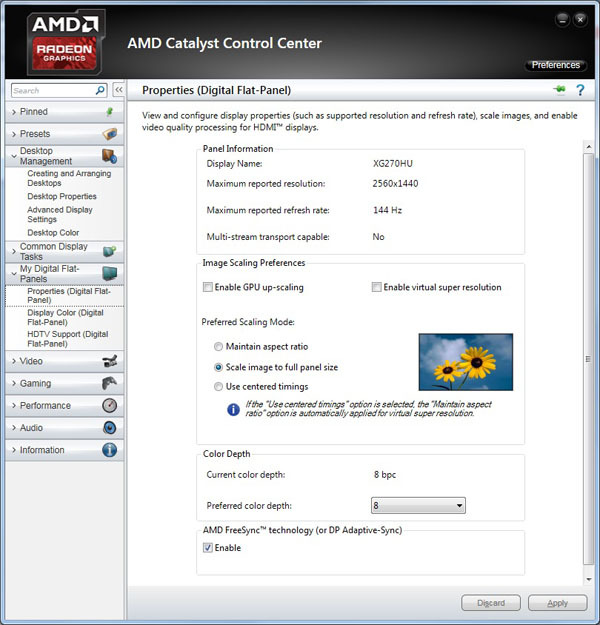 In addition to these tests, AMD also checked how each solution behaves if you operate outside of the supported range. i.e. what happens if you provide a frame rate above the maximum supported 144Hz, or below the bottom end of the range supported by the monitor. With NVIDIA G-sync, the solution behaves as if you had V-sync on, capping the frame rate at 144fps maximum for instance if you exceed 144Hz. With AMD FreeSync you actually have the option as a user to either have V-sync on or off for operation above the maximum supported refresh rate. So if you have a powerful enough system you are able to output more frames if you want. Obviously you're back into the realms of possible tearing etc with V-sync off, or into the realms of some possible lag and stutter with V-sync on, but you have the choice as the user at least. 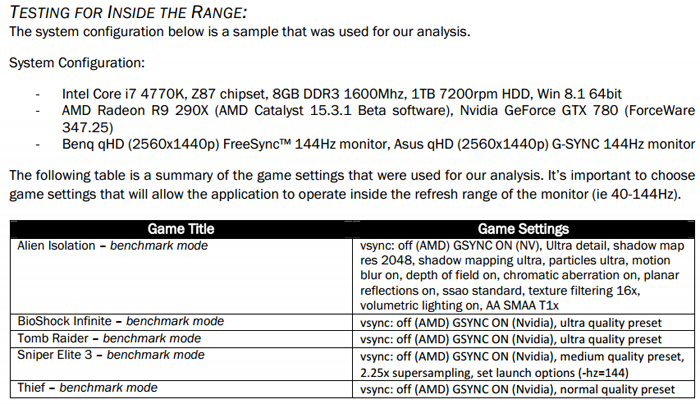 Their tests here confirm that operation, using V-sync off when out of range of FreeSync. Again test environment described here if you want more info. It should be noted that the real benefits of variable refresh rate technologies really come into play when viewing lower frame rate content, around 40 - 75fps typically delivers the best results compared with Vsync on/off. At consistently higher frame rates as you get nearer to 144 fps the benefits of FreeSync (and G-sync) are not as great, but still apparent. There will be a gradual transition period for each user where the benefits of using FreeSync decrease, and it may instead be better to use the Blur Reduction feature if it is provided on the screen. Higher end gaming machines might be able to push out higher frame rates more consistently and so you might find less benefit in using FreeSync. If provided, a Blur Reduction mode could then help in another very important area, helping to reduce the perceived motion blur caused by LCD displays. Keeping in mind that the XG270HU features a large 2560 x 1440 resolution, you'd need a pretty powerful system to achieve consistently high frame rates, so we'd encourage you to try FreeSync of course to see how it affects your gaming usage. 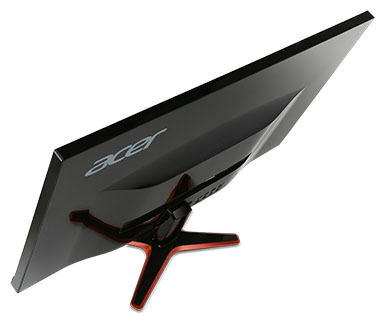 Sadly Acer haven't added a blur reduction mode on this model anyway, so you might as well stick with FreeSync. From a monitor point of view the use of FreeSync creates a problem at the moment on the XG270HU at the moment, just as it had on the BenQ XL2730Z we tested recently. 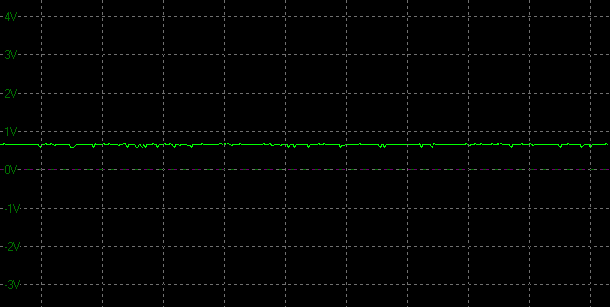 The issue is that the OD (overdrive) setting does nothing when you connect the screen over DisplayPort to a FreeSync system. This applies whether you are actually using FreeSync or not, you don't even need to have the option ticked in the graphics card settings for the problem to occur. As a result, the OD setting appears to be in the off state, and changing it to Normal or Extreme in the menu makes no difference to real-World response times or performance. As a result, response times are fairly slow at ~7.7ms G2G and there is a more noticeable blur to the moving image. See the more detailed response time tests in the previous sections for more information, but needless to say this is not the optimum OD (response time) setting on this screen. For some reason, the combination of FreeSync support and this display disables the OD function. This only happens when you are using a FreeSync enabled graphics card, FreeSync capable drivers and the DisplayPort interface. If you switch to DVI or any other interface (which don't support the FreeSync feature) even from the same graphics card/driver then OD behaves as it should again. If you use DisplayPort but revert to an older non-FreeSync enabled driver package then OD works as it should. If you use a non-FreeSync supporting AMD card, or a card from NVIDIA/Intel then OD functions as it should. It's only when all 3 things are combined that the problem seems to occur. Obviously if you eliminate one of them to make OD work properly, you lose the advantage of FreeSync dynamic refresh rate control. We know from our review of the BenQ XL2730Z, and our conversations with them about it that the issue is a known bug which apparently currently affects all FreeSync monitors. 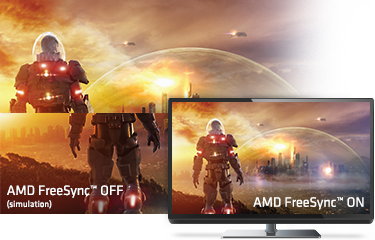 The AMD FreeSync command disturbs the response time function, causing it to switch off. It's something which will require an update from AMD to their driver behaviour, which they are currently working on. It will also require a firmware update for the screen itself to correct the problem. We know that AMD are working on their updated drivers, and we've asked Acer for comment on how they might handle firmware and screen updates. Assuming that fixes the issue the performance when using a FreeSync system should be better than now, as you can move from OD Off to the better OD Normal setting. At the moment if you use the FreeSync function, or even just have a FreeSync enabled system in place, the response times are slower than they should be by a fair amount, and so you will experience a moderate amount of blur. To be fair they aren't really slow (7.7ms G2G measured) but they just aren't as fast as they could be and show some more noticeable blurring than OD normal. If you need to, you can always switch to DVI or another interface other than DisplayPort to benefit from the OD setting (but lose FreeSync). We will update this review section when we know more about a fix for this issue. Update 2nd July 2015 - Acer have confirmed a firmware update has now been made available to their service teams to address any issues people are facing with the activation of overdrive with FreeSync systems. The following statement was provided to us: "Customer service and experience are priorities for Acer. Customers owning an Acer XG270HU Monitor may potentially experience slower response times when connected over DisplayPort to FreeSync compatible graphic cards of the PC. When connecting to PCs with other graphic cards or connection options there is no impact on the performance and response time. Customers which believe they are experiencing a potentially slower response time than normal, may contact the nearest Acer Service Center for a firmware update." We've already tested above the actual pixel response times and other aspects of the screen's gaming performance. We wanted to carry out some pursuit camera tests as well to give an even more complete idea of the performance of this screen, and the improvements made to motion blur when using the Blur Reduction feature also. We used the Blurbusters.com Ghosting Motion Test which is designed to be used with pursuit camera setups. The pursuit camera method is explained at BlurBusters as well as covered in this research paper. We carried out the tests at various refresh rates, with and without Blur Reduction enabled. These UFO objects were moving horizontally at 960 pixels per second, at a frame rate matching refresh rate of the monitor. We conducted the above tests over the DVI connection so that we could use the optimum OD setting of Normal. These tests capture the kind of blurring you would see with the naked eye when tracking moving objects across the screen. As you increase the refresh rate the perceived blurring is reduced, as refresh rate has a direct impact on motion blur. It is not eliminated entirely due to the nature of the sample-and-hold LCD display and the tracking of your eyes. No matter how fast the refresh rate and pixel response times are, you cannot eliminate the perceived motion blur without other methods. Unfortunately there is no Blur Reduction mode available from this screen so you are not able to reduce perceived motion blur further using a strobe backlight. See the relevant section in our BenQ XL2730Z review for an idea of how much blur can be eliminated using a strobe backlight system. Aspect Ratio Control - The XG270HU has 3 options for aspect ratio control through the OSD 'setting' menu as shown above. There are options for full, aspect and 1:1 pixel mapping. Nice to see an automatic aspect ratio option available which will maintain the source input aspect ratio and scale to fill as much of the screen as possible. Also great to see a 1:1 pixel mapping mode. These are certainly useful for connection of external games consoles etc not running at 2560 x 1440 resolution. Note that NVIDIA G-sync screens at this time are not provided with an internal scaler, and so having these options available here is an advantage of using AMD FreeSync instead. Preset Modes - There is a no specific 'game' mode available in the OSD eColor menu, so if you wanted something different for your gaming uses you might want to try one of the other modes, which have preset brightness levels. At 600Hz the screen showed a total average display lag of 14.5 ms as measured with SMTT 2. 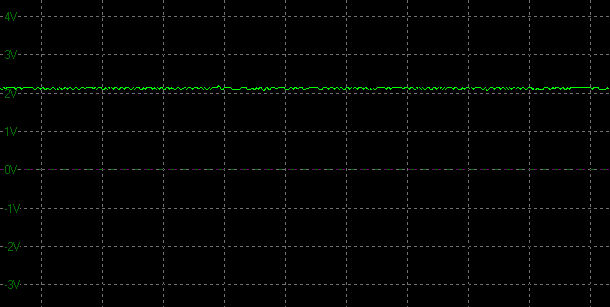 Taking into account half the average G2G response time at 2.15ms ('Normal' OD setting), we can estimate that there is ~12.35 ms of signal processing lag at this refresh rate. If you increase the refresh rate to 144Hz the lag is reduced nicely though, with a total display lag recorded of 5.0ms, giving an estimated 2.85ms of signal processing lag. This makes the screen very suitable for gaming, even playing fast FPS games. 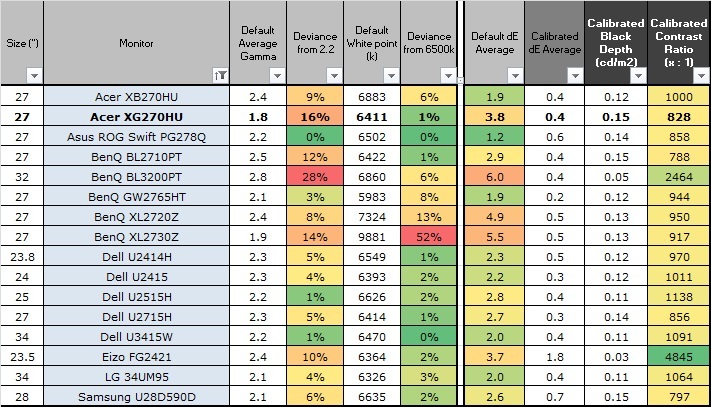 The overall gaming performance of the XG270HU was mostly positive, if we ignore FreeSync for a moment. Pixel response times were pretty much on par with the other fast TN Film panels we've tested, including the very popular Asus ROG Swift PG278Q and recent BenQ XL2730Z. While the pixel transitions were slightly slower, Acer had toned down the overshoot a bit which we preferred. You will want to stick with the OD normal mode if possible for optimum performance. Input lag was also low as well which was pleasing, although you want to be running at a higher refresh rate is possible to offer the lowest lag. One significant upgrade compared with a lot of older gaming screens was the additional resolution, offering a big jump from 1080p to 1440p and keeping it up to date with a few other modern gaming screens with high resolutions. Make sure you have a powerful enough system to run this kind of resolution. For those who can't output 2560 x 1440 @ 144Hz the addition of AMD's FreeSync technology should be a welcome move. It does function correctly in terms of handling dynamic refresh rates and offers a very useful alternative to traditional Vsync. However, at the moment its implementation is not perfect, as it disables the OD (overdrive) function and so leads to reduced response times. We saw the same issue on the BenQ XL2730Z, and once Acer and AMD fix this issue we will update the review accordingly as it should then mean FreeSync is a real benefit. Even with the OD control not working with FreeSync systems, the response times aren't exactly "slow", they just aren't optimum and up to what the screen is capable of. We were a little disappointed that there was no blur reduction mode on this screen though. That comes as standard with G-sync screens via their ULMB mode, and we saw it added as an extra to the BenQ XL2730Z with FreeSync recently. Acer haven't added as blur reduction mode here unfortunately so it can't quite keep up with some gaming screens in features. It's lacking the massive range of gaming extras and useful tweaks that models like the BenQ XL2730Z offer, but the actual panel performance underneath is still strong. Good range of connectivity options provided with DisplayPort, DVI and HDMI 2.0. Being FreeSync capable does not limit the connections like a G-sync screen would, so it allows you to still connect external devices if you want. Cables provided in the box for DisplayPort and DVI. Wide brightness range adjustment possible from the display, including a very high maximum luminance of ~362 cd/m2 and a reasonable minimum luminance of 85 cd/m2. This should afford you good control for different lighting conditions. 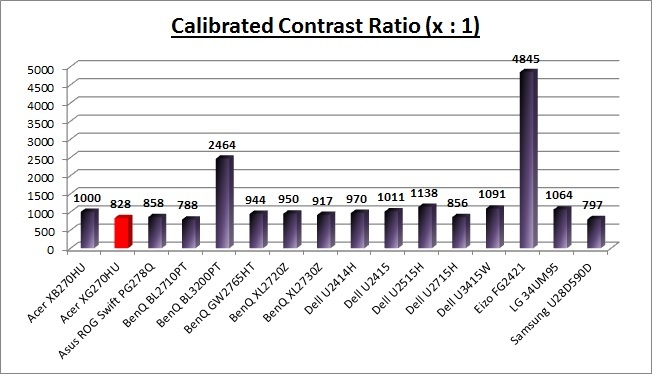 Contrast ratio remains stable across that adjustment range as well and is good for a TN Film panel. Brightness regulation is controlled without the need for PWM and so is flicker free for all brightness settings. Black depth and contrast ratio are pretty good for a TN Film panel at 828:1 after calibration. Detail in darker scenes should not be lost as a result. There is a specific 'movie' preset mode available but it's basically just a preset brightness level. 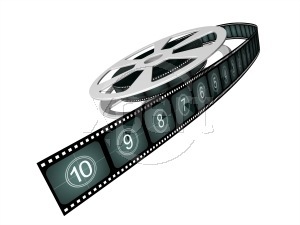 Excellent pixel responsiveness which can handle fast moving scenes in movies without issue. Quite low levels of overshoot as well. Stick with the 'Normal' OD setting. While the screen has a high refresh rate it is not NVIDIA 3D certified and so cannot support 3D content. Very limited range of ergonomic adjustments available from the stand, so not ideal if you want to keep moving the screen or changing the viewing angle. 2x 2W integrated speakers for some basic audio. Also an audio input and headphone out connection on this monitor. Decent range of hardware aspect ratio options which should provide you the scaling options you need. The XG270HU provided a good overall gaming screen, with some strong panel performance but a lack of some of the bells and whistles you will find from some other competing screens. Being a gaming screen there are a few areas of importance to focus on. Response times are nice and low, and the overshoot levels are actually pretty good and slightly better than most fast TN Film gaming displays. There's support for high refresh rates which is a must for a modern gaming screen, and the extra resolution provided is a big jump up from the wide range of 1080p models available. Lag is also nice and low and the overall gaming experience is positive. The addition of FreeSync should be a big plus as well, although at the moment it isn't functioning as well as it could because of the limits it places on the overdrive control. It's great that the addition of FreeSync isn't bumping up the retail cost a lot, and also has allowed Acer to provide a decent set of connectivity and scaling options from the screen also. Being a TN Film based panel you do have to of course live with some of the limitations of this technology, most obviously the restrictive viewing angles and colour/gamma shift. Default setup of the screen was geared towards gaming, and it was a little tricky to correct the gamma curve without a calibration tool which might put off some general users. The flicker free backlight was very welcome, and there was a good range of brightness adjustment offered from the backlight. The screen felt a little lacking compared with some high-end gaming screens. Models like the BenQ XL2730Z throw just about every gaming extra at you that you might want or think of, so the XG270HU felt a little more limited. Perhaps most noticeable was the lack of a blur reduction mode which was a shame. The stand was also very limited and restrictive and we would have perhaps liked a few more features and extras here. Still, the screen retails for an attractive £430 GBP (inc VAT) which puts it about £70 cheaper than the BenQ XL2730Z, and certainly a lot cheaper than G-sync models like the Asus ROG Swift PG278Q (£630). If you're after a FreeSync gaming screen and don't mind it being a little more limited, but at a lower cost, then this is worth considering.